I was surfing the web for honey ideas for my next Queen Bee mystery when I stumbled across Paddywax, a company "pairing favorite quotes with exquisite fragrances", and I just had to share with all you bibliophiles out there. Not only did I find a candle and fragrance collection called Journey of the Bee, with scents like rose, clover, raw honey, and orange blossom, but I also found a library collection. Light the Walt Whitman candle and bask in the aroma of grass, thyme, and red clover. The fragrance from an Edgar Allan Poe candle wafts through the air, carrying cardamom, absinthe, and sandlewood. Or decide between Jane Austen and Oscar Wilde. If you want to read the quotes, check out the rest of the classic authors represented, and maybe even order, go to Paddywax. Or if you buy all your stuff through Amazon, here's the link to the Library Collection there. I love candles. Don’t you? Very cute idea. I love candles, but ever since my cat, Schooner, set his whiskers on fire, I've been afraid to use them. I adore candles. I have a ton of Yankee Candles and the ones from Bath and Body Works. Both brands really smell up the whole house...in a good way! 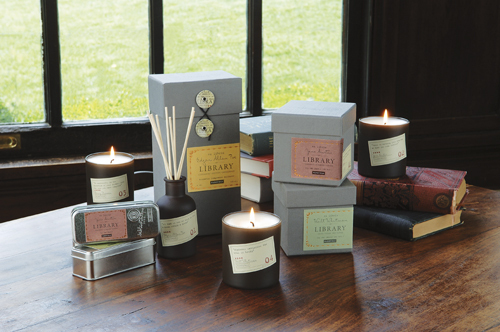 I love the idea of these literary candles-I'll have to check them out! Oh, thanks Deb! I love gardenias & jasmine, so added the Jane Austen scent to my Wish List. Well look at that! Thanks Lynn. I want to stay in the Honeypot Cottage! And it isn't that far from my home. Road trip. After doing some major cleaning, I discovered I have enough candles (mostly Yankee and Bath & Body Works) and holders, etc. to open my own store. And that I didn't need any more. I think I have a candle problem. Let me go see if I can add to it. haha. A candle addiction. That's a new one. I do love candles and have a number of beeswax candles that I made for myself. Sandlewood is a wonderful fragrance for a candle. These sounds great.